The actor Ôtani Hiroemon II held the name of Ôtani Ryûzaemon I from the 11th lunar month of 1716 to 1745. Ôtani Ryûzaemon I performing as a katakiyaku in the 11th lunar month of 1739 at the Nakamuraza in the kaomise drama "Miyakozome Kaoru Hachinoki"
Date of birth unknown. Son of Ôtani Ryûzaemon I, he made his debut as a child-actor in the 11th lunar month of 1732 at the Moritaza, where he received the name of Ôtani Fukutarô. 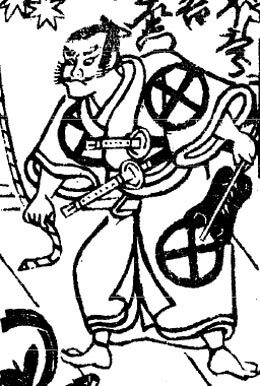 He took the name of Ôtani Hiroshichi I in 1739 and became katakiyaku in the 1st lunar month of 1743. He took the name of Ôtani Ryûzaemon II in the 11th lunar month of 1745 at the Ichimuraza, playing the role of Nabari Hachirô in the kaomise drama "Onna Kusunoki Yosooi Kagami", which welcomed in Edo the Kamigata star Yoshizawa Ayame II. He played in the 2nd lunar month of 1749 at the Moritaza the roles of Kô no Moronô, Ono no Sadakurô and Ôta Ryôchiku in the drama "Kanadehon Chûshingura". This was one of his last stage performances for he died in Edo the 26th of the 11th lunar month of 1749. His haimyô was Kinshû and he was the master of Ôtani Hiroshichi II. His tombstone was located in the precincts of the Jôshinji Temple in the district of Fukagawa. Dates of birth and death unknown. His first stage name was Ichikawa Taijûrô. 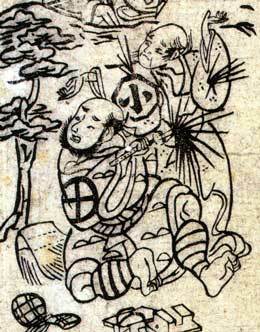 he became disciple of Arashi Kichisaburô III and received the name of Arashi Daijûrô. His next stage names in Ôsaka were Arashi Kichijûrô and Arashi Kichiemon. He took the name of Shibazaki Rinzaemon IV in 1870 and held it for a few years only. We don't known his relationship to the Ôtani clan. He took the name of Ôtani Ryûzaemon III in the 1st lunar month of 1872 at the Chikugo no Shibai, playing 3 roles in the new year drama "Keisei Soga Susono no Homare". He was active in Kamigata up to 1883. He was a good katakiyaku actor, but was also appreciated in jitsugoto, handôgataki or oyajigata roles.